One of the most missed opportunities for reimbursements is shuttle rides. Since most are using the paper and pen request for shuttle rides, often Service Advisors fail to put in the writing if the car is under warranty; therefore, the Dealership ends up losing money. Car Manufacturers like GM and Ford are willing to reimburse dealerships for shuttle rides because they don’t want their customers inconvenienced on having to bring the vehicle over for Service especially if the car is under warranty. So much so, these Car Manufacturers are willing to pay every time a customer needs a ride, and that amount can get doubled if the customer needs a two-way trip. We understand how busy Service Advisors get daily and its no wonder something like tracking of Warranty rides can be overlooked or missed entirely. That’s why Quickride has made tracking simpler by the use of our Command Center. 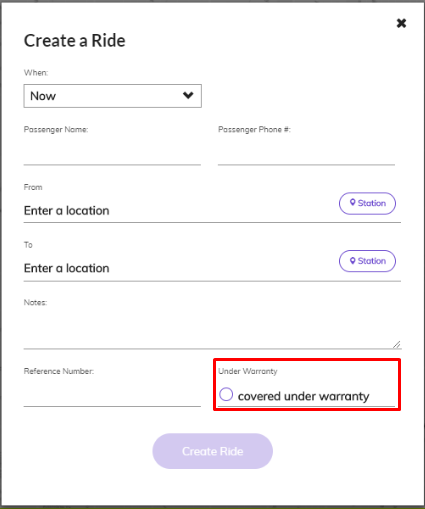 Once a ride has gets requested, you need to tick if the vehicle is under warranty. You can then download a report, and that will give you the list of all rides completed. You can then submit the report for reimbursement. To access the report, from the Command Center click on Control Panel and then select Ride Report. In the Ride report, you can search for the dates that you need the report or download them as well.